It is useful in addressing this question to consider the “Principle of Opposition,” as articulated by the great psychologist, Dr. Carl Jung. Everything, he notes, within the world we know appears to us in pairs of opposites: up and down, light and dark, hot and cold, male and female, time and space, conscious and unconscious (these ideas can be traced back to Hegel and Kant). We live within this realm of duality. We discover early on, however, that in order for us to grow and to become fully formed individuals, we must engage in a process of bringing together these opposites, in order to become whole. Dr. Jung called this the Process of Individuation, the emergence of a whole, integrated Self from undifferentiated unconsciousness. Essentially, this is the battle, played out in the human ego and psyche, between “I” and “Not I,” the resolution of which manifests and structures new consciousness. It is this process of becoming aware of one’s true self, wholeness within and beyond the realm of duality, that structures consciousness and brings purpose and meaning to human existence – it’s why we’re here. 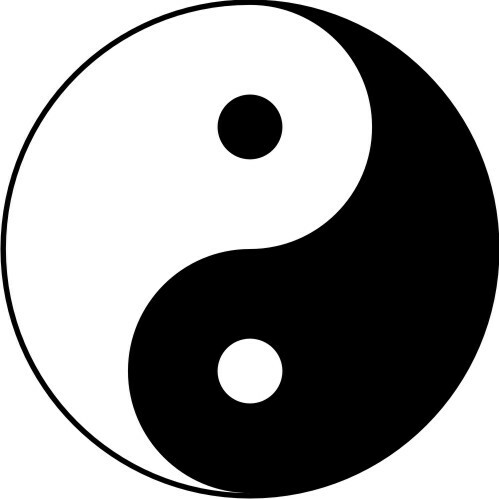 The Yin Yang symbol in Chinese philosophy describes how apparently contradictory opposites are actually complementary and interconnected in wholeness. It is in the synthesis of the opposites, taking place within the crucible of the human ego, that consciousness is structured, is uncovered and shared (with all life and with the transcendent). In essence, the synthesis of the opposites (in this process of Individuation) connects the Ego with the Soul – that which transcends the Ego. This forms the essence of what Dr. Jung identified as the New Myth for Humanity. “God,” or the Transcendent, in this new myth, is unaware of creation but wishes to know it, thus occupying one end of an opposition. Humanity, on the other hand, is conscious of creation but is unaware of its divinity, forming the other end of this pair of opposites (Divine and Man). Human consciousness endows the Transcendent’s creation with objective existence by the observation of and participation in it, bringing into awareness that which was merely potential within a world of non-being. So, humanity is indispensable to the Transcendent for the completion and perfection of creation – humanity is, in essence, the second creator of the world by observing and interacting with it. Man’s conscious knowing and God’s unconscious being form two poles in opposition to each other that, when synthesized and resolved, unfolds and manifests consciousness. As such, for “God” to become aware of creation, all opposites must be united within the human psyche. As we bring union to the opposites, we actualize that which was only in potential; by making conscious what is unconscious, we arrive at wholeness, allowing the Soul and Ego to exist in beautiful alignment, while serving a purpose far greater than any individual Ego could imagine.